Few individuals involved in the stamp collecting hobby in the United States have left a richer, more diverse legacy than the quiet-spoken, yet proud stamp dealer from Philadelphia, Eugene Klein. He is one of those rare individuals who was both collector and dealer—and excelled at both. By the turn of the last century, Klein had established himself as a commercial philatelist in the City of Brotherly Love and was making a name for himself by supplying imporant U.S.and foreign specialized material to some of the better known collectors of the period. prominent client, Col. E.H.R. Green. One of the early founding members of the American Stamp Dealers Association, Eugene Klein was also president (1935-37) of the American Philatelic Society, a rare position for a dealer. In 1935, he founded the American Philatelic Congress, the respected 72-year old organization that publishes annual scholarly papers on philatelic subjects, and he hosted its first convention in his hometown that same year. His auction firm sold many major holdings, including two sections of the Henry Gibson collection in 1923 and 1944. 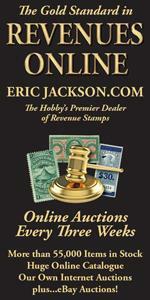 A philatelic scholar, himself, he authored the key book on the postal markings of U.S. inland waterways. Klein was inducted into the APS Hall of Fame in 1944.